Foot n’ Field Since the first snowfall several weeks ago, Coyote Watch Canada has received over three dozen coyote connections from communities across Ontario, the East Coast and from communities south of the border. 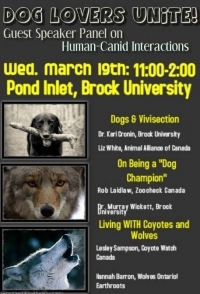 Many of the reports from Ontario are coyote sightings, while others are education outreach efforts. Wild boars that escaped their confinement now have a mark of death on their shoulders. Not much is known about the origin of the wild boars in terms of who held these animals as property and from whose property they fled. A News Release by the North Bay Police Services featured yesterday by BayToday titled Bear found near downtown is not only short but truly sweet! Kudos to the North Bay Police Department, Ministry of Natural Resources & Forestry and the greater community for deploying cooperation, compassion, patience and humane intervention to assist a wandering bear! As the sun sets glowing red, purple and gold along the pristine foothills of Alberta the beauty of the scene is punctuated by the chatter and howls of the beloved song dog, Canis Latrans, the Coyote. 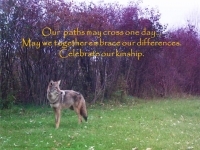 Aboriginal stories of Coyote are wrought with tales of their mischievousbehaviour and amazing ability to adapt. 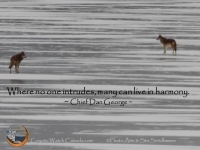 The Beauty of Coyote Communication by Rick Lamplugh Recently Mary and I had the good fortune to watch a family of Yellowstone coyotes as they shared a meal. We stumbled upon them while hiking in snow along the Gardner River. Kyle Fawcett, Minister of the Environment (ESRD.Minister@gov.ab.ca) Premier Jim Prentice (Premier@gov.ab.ca) January 6, 2015 Hello Honourable decision makers. I am writing to inquire as to why the Government of Alberta would allow a coyote killing contest to take place within the province? “Facts and science are very important, but it is stories that move our hearts.” Chris Albert, 2014 “Katy is distracted and distracting to the class” was written on her report card. Katy was startled, and sad. She liked her teacher. She didn’t know why she was the way she was.